How A Private Investigator Can Help You Before Police? Many times you don’t feel confident enough to report a matter to police. Especially if you are just suspicions about something wrong. Many times wife doubts their husbands on grounds of infidelity, but it doesn’t mean on mere suspicion they can report the matter to police. That’s where private investigators are approached to first be sure on your doubts. Private investigators have some very important uses in our society, and here are some of the most common reasons we use them. It is awful condition to live with doubts in your mind regarding your husband’s / wives changed behaviour. If you find yourself stuck that your wife or husband is cheating on you can hire a private investigator to know the truth. They are experts and are excellent in helping you know the truth. They will follow your spouse, and he / she will be put under surveillance unless the truth comes out. Many times private detectives help jot down evidence to be presented in front of law. If any of your dear one went missing then a private investigator becomes the best source to find out the truth. They will help you search the matter and often are faster than police to locate the person went missing. You can contact a private investigator to search a lost contact, tracking a defaulter or to know the whereabouts of your children. The police are often slow in such matters. It is the most required service by a private detective agency. If you feel trapped in scam of some kind, do not feel miserable. However, you can hire a PI to help you come out it with solid proof of you being non-guilty. They will perform the sting operation to collect evidence of wrongdoing and help you recover your money / reputation and mental peace. What if your daughter suddenly announces that she is getting married to someone completely stranger? Many times parents feel lost control over the lives of their children. In such instances, it becomes essential to dig into the past lives of person on which your future depends. 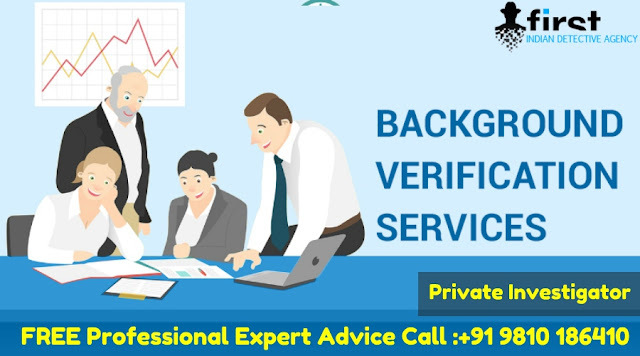 Hence, Background Verification Services in Delhi becoming quite popular these days. Background verification can turn reveal past matter from credit card abuse to jail sentences. There are many other instances as well where you would be needing help of a private investigator. To know more about our PI Services – Visit our website First Indian Detective Agency Pvt Ltd now; or you can directly talk to our experts at +91 9810 186410 / 8010 703710, call now!